This form is drafted for use when a tenant is expanding its space, and substantial improvements are contemplated for the expansion space. A separate construction exhibit is attached to the document to govern the construction process. The tenant is also granted substantial exterior signage rights in the amendment, as well as additional expansion options. THIS LEASE AMENDMENT (the “Amendment”), is made and entered into this _____ day of ________, 200_, by and between COMMERCIAL PROPERTY LANDLORD, INC., hereinafter referred to as "Landlord," and ACCEPTABLE TENANT, INC., hereinafter referred to as "Tenant," and modifies that certain lease (the “Lease”) executed on ________________ by and between Landlord and Tenant. 1. Subject to and upon the terms, provisions and conditions set forth in the Lease and this First Amendment, and each in consideration of the duties, covenants and obligations of the other hereunder, Landlord does hereby lease, demise and let to Tenant and Tenant does hereby lease and take from Landlord an additional _______________ (____) square feet of Net Rentable Area located on the __________ (__th) floor of the Building, as reflected on the floor plan attached hereto as EXHIBIT A-1 (the "Additional Office Space"). From and after the Effective Date of this First Amendment, the term "Office Space" as used throughout the Lease shall mean the Initial Office Space and the Additional Office Space, collectively. From and after the Effective Date of this First Amendment, the term "Leased Premises" throughout the Lease shall mean the Initial Office Space, the Additional Office Space and the Storage Space, collectively. Landlord and Tenant hereby stipulate and agree that for all purposes of the Lease the Net Rentable Area of the Initial Office Space, the Additional Office Space and the Storage Space are as stated above, notwithstanding any variations in the actual measurements thereof. (b) For the period commencing on _________ and continuing through _____________, (i) Thirteen and No/100 Dollars ($13.00) per square foot of Net Rentable Area within the Office Space and (ii) ____________ Dollars ($________) per square foot of Net Rentable Area within the Storage Space, payable in monthly installments equal to __________ Dollars ($___________) each. 3. Notwithstanding anything contained in the Lease to the contrary, the "Base Calendar Year" for the Additional Office Space shall be the calendar year __________ . Landlord's good faith estimate of the Actual Operating Expenses for the calendar year __________ is $_____ per square foot of Net Rentable Area. 5. The Additional Office Space shall be delivered to Tenant, and Tenant shall accept same, in the condition and with only such leasehold improvements, if any, as set forth in EXHIBIT A attached hereto. 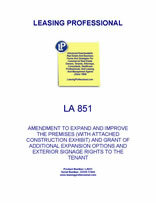 As used in the Lease, the term "Initial Leasehold Improvements" shall include (a) with respect to the Initial Office Space and the Storage Space, any and all improvements and tenant finish existing in the Initial Office Space and the Storage Space as of the Commencement Date, including all leasehold improvements, if any, as defined and described in Exhibit A attached to the Lease, as well as any and all Alterations (as defined below) and subsequent improvements made to the Initial Office Space and the Storage Space during the term of the Lease and (b) with respect to the Additional Office Space, any and all improvements and tenant finish existing in the Additional Office Space as of the Commencement Date, including all leasehold improvements, if any, as defined and described in EXHIBIT A attached hereto, as well as any and all Alterations (as defined below) and subsequent improvements made to the Additional Office Space during the term of the Lease. 6. Landlord and Tenant hereby acknowledge and agree that the "Commencement Date" occurred on __________ , _________.